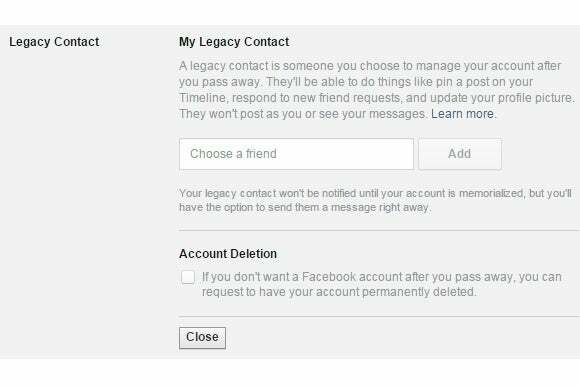 Facebook is giving users more control over their social networking afterlives with a “legacy contact” setting. With this setting enabled, a designated heir can change the deceased user’s profile picture, pin a memorial letter to the top of the profile, and respond to friend requests. The legacy contact can also download an archive of photos and posts. However, Facebook is making clear that this is not the same as handing over your password. Legacy contacts won’t be able to edit old posts, access private messages or delete the entire account. Facebook told the Wall Street Journal that it ruled out further access “for this first version,” and noted that adding more responsibilities could just hinder the grieving process. Facebook users can set up a legacy contact through the Security section of the settings menu. In the past, Facebook would freeze the account when it learned of the user’s death, while also adding the word “Remembering” next to the person’s name and removing any ads from the profile page. This option for “Memorialized Accounts” is still the default. Users who want to add a legacy contact can do so through Settings > Security > Legacy Contact. Friends and loved ones can also still set up a group memorial page for the deceased. Legacy contacts are only available to U.S. users for now, with support in other countries to follow. Why this matters: While some states have tried to come up with “digital will” laws, and the U.S. government recommends creating your own will, the best solutions will come from the online services themselves, as they can provide granular controls over account access. Facebook is hardly the first to do so—Google has offered an “Inactive Account Manager” since 2013—but having these controls on the world’s largest social network goes a long way toward helping people figure out their digital legacies.